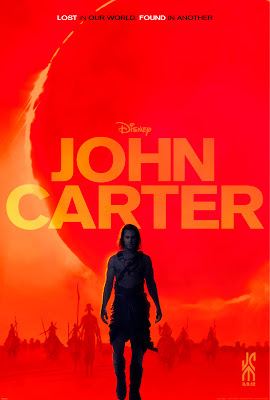 John Carter is a 2012 American science fiction action film that tells the first interplanetary adventure of John Carter, the heroic protagonist of Edgar Rice Burroughs' 11-volume Barsoom series of novels (1912–43). The film marks the centennial of the character's first appearance. The film is the live-action debut of director/writer Andrew Stanton; his previous work includes the Pixar animated films Finding Nemo (2003) and WALL-E (2008). Co-written by Mark Andrews and Michael Chabon, it is produced by Jim Morris, Colin Wilson, and Lindsey Collins, and scored by Michael Giacchino. Walt Disney Pictures distributed the film and released it in the United States on March 9, 2012; the film was shown in regular 2D and in the Digital 3D and IMAX 3D formats. Filming began in November 2009 with principal photography underway in January 2010, wrapping seven months later in July 2010. Upon release, John Carter received a mixed critical reception from film critics and performed poorly at the domestic box office, although it showed strength overseas. Despite a $183 million global box office revenue in its first ten days, Disney reported that it expected the film to lose up to $200 million in the fiscal quarter.